(Video) Patriots Assaulted By LA County Security for Opposing Aid to Illegal Aliens, Trying to Talk to County Supervisor | Stop Obama Now!! 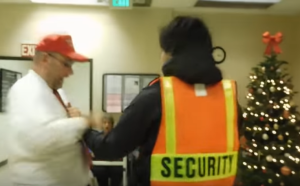 Patriot battered by secuirty Patriots were assaulted when trying to meet with an LA County supervisor to express their opposition to a measure designed to defeat Trump’s expected enforcement of the immigration law in LA County. They want to make the borders open to illegals, but the offices of the politicians are ironically closed, locked, secure, walled-off and fully protected against irate constituents, who don’t want 10’s of millions of their tax dollars spent defending illegal aliens. POLICE WERE CALLED TO ‘DEPORT’ THE TAXPAYERS!! Constituents and citizens dropped by Supervisor Hilda Solis’ office. Her staff members refused to meet with the group. A security guard was called on scene who assaulted Arthur Schaper while taking video. Arthur Schaper filed a police report. I would say that is an assault on all of them, because it put all of them in fear of being battered by the security officer run amok.